"What Makes Me Feel This Way"
Above: Photo of The Sultans with band leader Lionel Hampton. 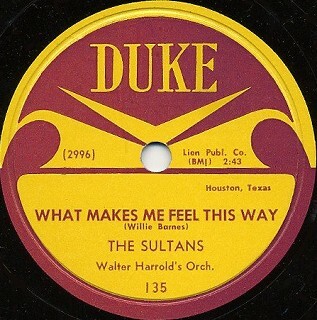 The Sultans recorded for the Duke label and then became The Admirals when they joined the King label in 1955. From Trade Magazine Article Dated June 1954: Irv Marcus, Peacock-Duke National Sales Manager, is talking up a new group, the Sultans, five teenagers who reflect "a pleasant new sound in R&B." The boys really wowed 'em last Sunday at the Music Guild of Nebraska's big statewide meeting. All who attended came away convinced that these boys are destined for big things. The quintet is led by tenor voice Willie Barnes, just recently graduated from Omaha Tech High. 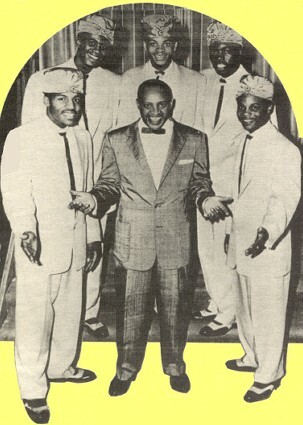 Other members of the Sultans include Richard Beasley, Jim Farmer, Wes Devereaux and Eugene McDaniels. From Marv Goldberg (2-22-04): Sultans' member Wesley Devereaux was the son of Wynonie Harris. Above: Label image of Duke 135 released in 1954. Willie Barnes wrote this song and was lead singer on it. It was The Sultans third and final release on Duke. As The Admirals, they had two releases on King. Click on an option below to listen to "What Makes Me Feel This Way" by The Sultans using RealPlayer.